The Mexican Red-knee Tarantula (Brachypelma Smithi) is a terrestrial tarantula native to the western faces of the Sierra Madre Occidental and Sierra Madre del Sur mountain ranges in Mexico. They are a large species, and are a popular choice for enthusiasts. Like most tarantulas, they live a very long life, up to 30 years. Their natural habitat is in deciduous tropical forests in the hilly south-western Mexico, especially in Colima and Guerrero. Mexican red-knee tarantulas are large, dark spiders that range up to 14 cm in length. They have a black abdomen that is covered in brown hairs. Their legs have orange to dark red-orange joints, giving them their name. Their carapace is creamy beige in colour and has a distinctive black square. The cephalothorax has four pairs of legs, a pair of pedipalps, and hollow fanged chelicerae connected to venom glands. They hold and catch prey with the first 2 legs and walk with the other legs. An adult male has a body roughly 4 inches long, with a leg span of 6 inches, and a mass of approximately 15 grams. Both sexes are similar in appearance, with the male having a smaller body, but longer legs. Though the male is of comparable size to the female, the male has a much smaller mass. 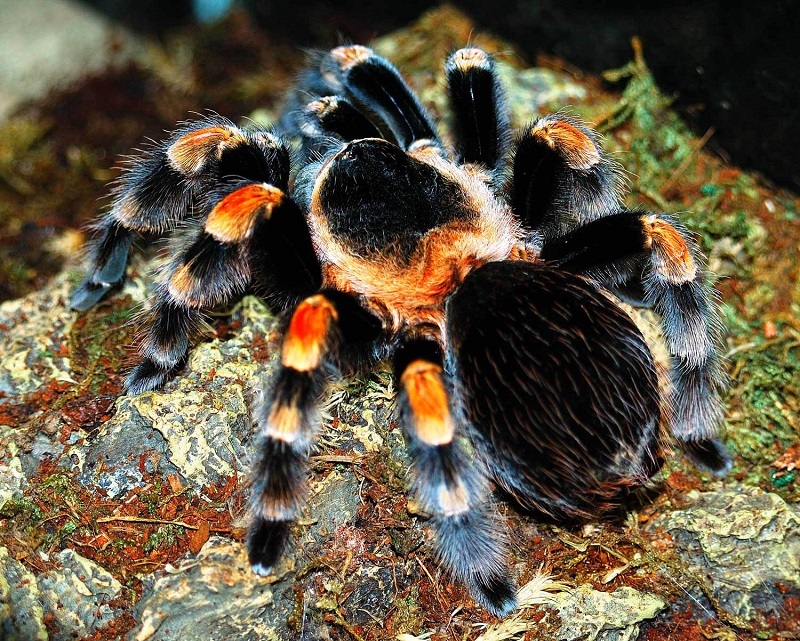 As with all tarantulas, the Mexican red knee is a mygalomorph, and must go through a moulting process in order to grow. It is an essential part of their life process. Moulting serves several purposes, such as renewing the tarantula's outer cover (shell) and replacing missing appendages. As tarantulas grow they will regularly moult (shed their skin), on multiple occasions during the year, depending on the tarantula's age. Since the exoskeleton cannot stretch, it has to be replaced by a new one from beneath. A mygalomorph may also regenerate lost appendages gradually, with each succeeding moult. Prior to moulting the spider will become sluggish and stop eating in order to conserve as much energy as possible. Their abdomen will darken; this is the new exoskeleton beneath. Normally the spider will turn on its back to moult and lie still in that position for several hours. Once this has been accomplished, the tarantula will not eat for several days to weeks, and it is not uncommon for them to not eat for up to a month or more after a moult, as its fangs are still soft: the fangs are also part of the exoskeleton and are shed with the rest of the skin. The whole process can take several hours and sheathes the tarantula with a moist new skin in place of an old, faded one. Like most New World tarantulas, they will kick urticating hairs from their abdomens and their back legs if disturbed, rather than bite. They are only slightly venomous to humans and are considered extremely docile, though, as with all tarantulas, allergies may intensify with any bite. Click HERE for a Mexican Red Knee Tarantula care sheet.